As of today the trail is still unpaved at the Nob Hill Rd. trail head. New pavement has been laid at the other end of the trail, between Syene and County MM. 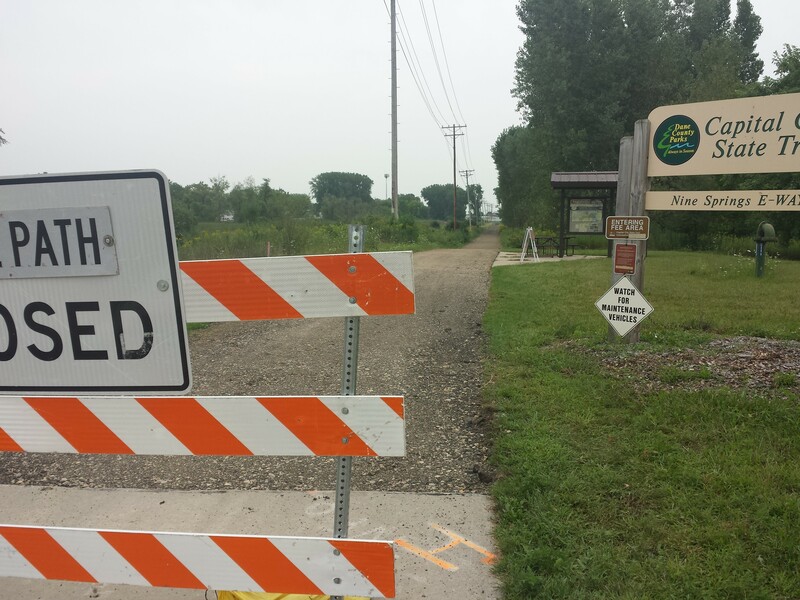 Chris James with Dane County Parks gave us an update on the project and they are hopeful that the trail project will be completed by Labor Day weekend. We will all be glad once this project is complete! Capital City Trail at Nob Hill Rd. as of August 20. Image credit Jim Wilson. Save the date for the Madison Bikes Party. We'll celebrate biking in Madison with our members and anybody else on Saturday, September 29 at StartingBlock Madison. Many more details to come! Monday, August 20, at 6:00 PM Madison Bikes is going to have party planning session to iron out some of the details for our party. If you want to help out, send a quick email to harald@madisonbikes.org and he'll send you more information. Tuesday, August 21 is an important Middleton Common Council meeting. Local bike advocates are trying to get Middleton to include bike lanes on the recently reconstructed High Point Blvd. between Greenway Blvd. And Terrace Ave. This is an important north-south route that parallels the beltline and is the only convenient north-south route in the area for people on bikes. This route would be greatly enhanced by the inclusion of bike lanes. Please consider sending an email to the Middleton Common Council or attending the meeting in support of bike lanes on High Point. Here’s a link to the Common Council meeting. The agenda item is near the bottom of the page under Ordinances – First Reading. Read about the proposal here. The meeting starts at 7:30 PM in the Middleton Council Chambers in the Middleton City Hall at 7426 Hubbard Ave. in Middleton. Wednesday, August 22, is the next meeting of the Transportation Commission. The meeting starts at 5:00 PM in room 351 of the City County Building at 210 Martin Luther King Jr Blvd. You can read the agenda here. At the meeting will be a few informational presentations including an update on the Gammon Rd geometry and the 2019-2023 Transportation Improvement Program (TIP). Also Wednesday is the first Public Input Meeting for the Fish Hatchery Road reconstruction project. The City of Fitchburg will reconstruct Fish Hatchery Road between McKee Road and the Beltline, anticipated to begin in late 2019. The meeting will take place at the Fitchburg Public Library Meeting Room at 5530 Lacy Road in Fitchburg. The Meeting Room is on the second floor. Please consider attending this meeting. Saturday, August 25, join the Capitol Off Road Pathfinders for the grand opening of the Cross Plains Trail. Check out the Facebook event here. You can find the group at their REI tent at the corner of KP and Bourbon Rd. The event starts at 10:00 AM with some fine-tuning work on the trail. At noon they will have the official ribbon cutting, food and drink, and the inaugural rides of the new trail. On the Madison Bikes Facebook group, the question comes up again and again: How is the repaving of the Cap City Trail coming along? According to the official timeline, the project should be done around August 20. At the moment, it looks like the old pavement had been removed, but nothing is paved yet. The reconstruction of Crazylegs Plaza is coming along nicely. The bike path is open (but not the connection to Oakland Ave). A bunch of bike racks are on site, ready to be installed. Tonight at 6 pm the Madison Bike Events Committee will be meeting at Bariques on Park Street. They will be discussing plans for the annual party, and could use some help. If you are interested in helping with the plans and on the day of the party, please join us tonight. Don’t forget to vote! More info is available here. Advocacy Committee will be meeting at Bendyworks (106 E Doty St #200) at 6:00 pm. The committee is always welcoming new people, if you’d like to help us out with our work on advocacy issues, feel free to stop by. Mountain Bike Demo at Pleasant View Golf Course. The best way to find the bike that's right for you is to spend time riding a few different models. Join Trek at Quarry Ridge to test ride a variety of all-new Trek mountain bike models! All you need to bring is a helmet, an ID, and your own pedals if you prefer something other than standard flats. Expert technicians will be onsite to help with fit and to answer questions. Family Bike Camping The ride from The Cargo Bike Shop to Brigham County Park is approximately 30 miles. We will spend the majority of our ride on the Military Ridge State Trail (trail passes required, can be purchased at The Cargo Bike Shop). The path is paved asphalt to start, transitioning to crushed limestone in Verona. Terrain is slightly uphill all the way to the park (approx 750ft elevation gain), but very manageable. You can ride with the group, or use our queue sheet and ride at your own pace and/or your own schedule. I want to start this week’s post off by promoting a short survey by some folks over at Bendyworks who formed a new group tentatively called “People for a New Bike Challenge”. 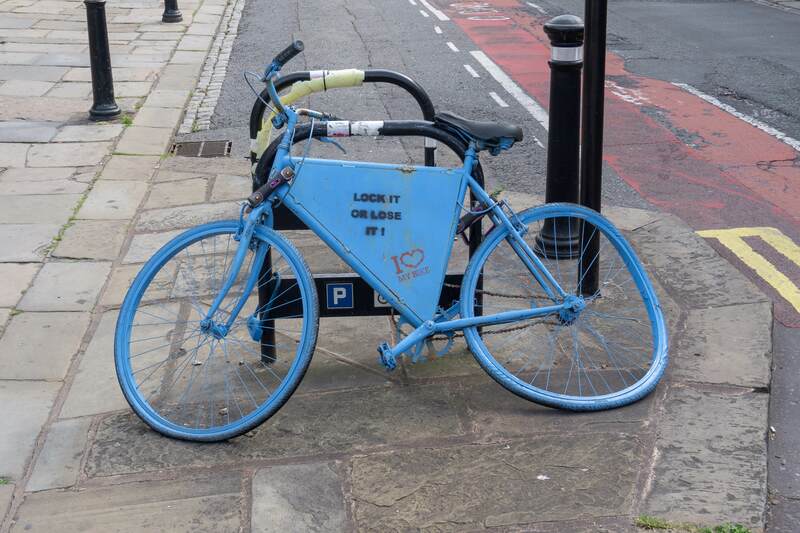 They are seeking local input by people who are familiar with the National Bike Challenge to, as the name suggests, develop a new bike challenge to encourage people to get out and ride. The survey is short and took me less than five minutes to complete. If you haven't participated in the National Bike Challenge before, you can still complete the survey and provide input. 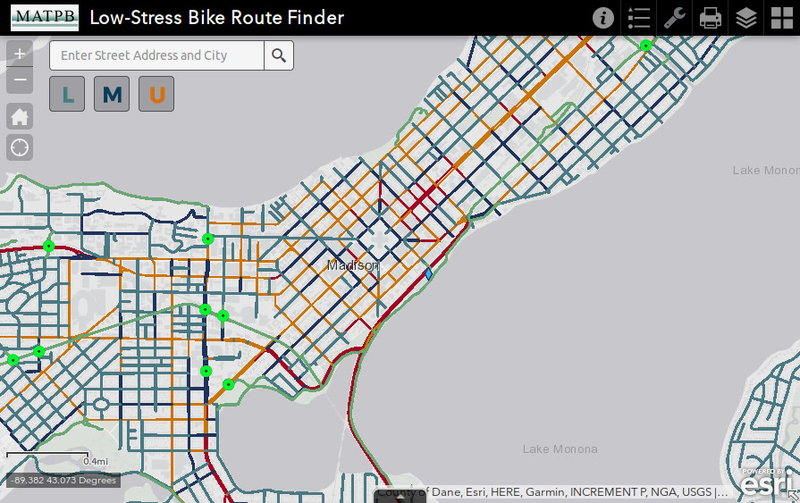 On Tuesday, the Madison Area Transportation Planning Board released its low stress mapping tool. The tool allows you to select from Low, Medium, and Unrestricted routing options which will give you a suggested route based on your preferred level of cycling stress. The tool is pretty straight forward to use so feel free to give it a shot. Also announced last week was the first meeting of the new Transportation Commission (TC) and the new Transportation Policy and Planning Board (TPPB). The first meeting of the two committees that formally replaced the Pedestrian Bicycle and Motor Vehicle Commission, the Long Range Transportation Planning Committee, and the Transit and Parking Commission will be a joint meeting taking place on July 31 at 5:00 P.M. The location of the meeting has yet to be announced so stay tuned for that information. 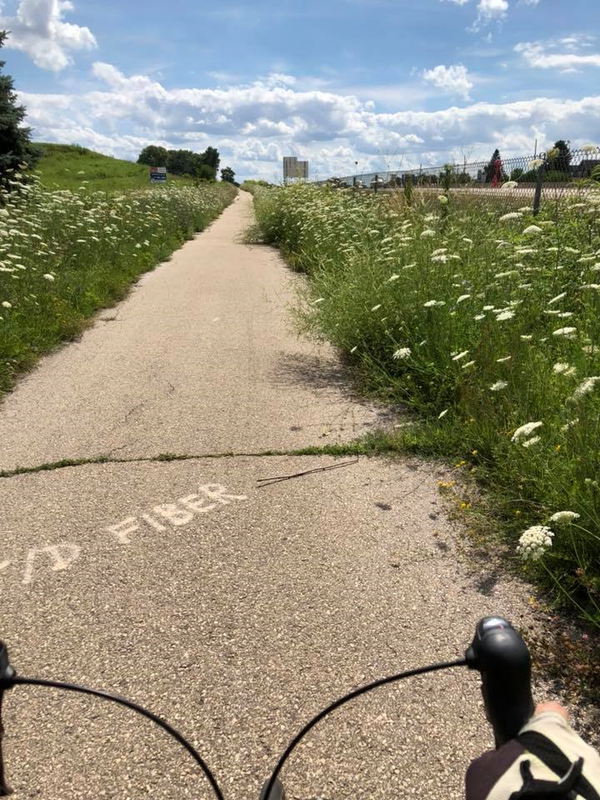 There was also some discussion on the Facebook page about maintenance of a the bike path that runs between Madison and Sun Prairie along US-151 after pictures were posted of plants overgrown onto the path. Apparently that interjurisdictional path has neither jurisdiction it goes between maintaining it, so further discussions surrounding that path are warranted. Monday, July 23, Bike Fitchburg is having its monthly meeting. As usual, the meeting starts at 6:30 P.M. at the Fitchburg Public Library located at 5530 Lacy Rd in Fitchburg. The Bike Fitchburg meeting has been rescheduled to next Monday (7/30). Tuesday, July 24, the Atwood Avenue reconstruction project goes before Madison’s Common Council for final approval of the roadway geometry. This project was recently considered as an alternative to the Buckeye and Cottage Grove Road projects as the city and the county had disagreements over the future roadway maintenance responsibilities for these streets, which are both county highways and in places are completely surrounded by the city. Last week, however, the city and the county managed to come to an agreement, so a resolution authorizing the city to enter into a funding agreement with the county over those two projects will be introduced to the Common Council on Tuesday, where it will then be sent to the relevant committees for review before going back to Council for final approval. What this all means for the eventual time line for construction of these road projects remains to be seen. And on Saturday, the Madison Trek Stores are having a mountain bike demo at Quarry Ridge. This event had to be moved from last weekend because of wet conditions. Let's hope the weather holds up this time around. The Common Council met this past Tuesday and passed a variant of Option 1 for Winnebago this week. This is the cross section that provides 13' for parked cars and bikes and 10' for cars, trucks, and buses with no buffer. It will function similarly to how it does today, although with a narrower travel lane (10' instead of 11'). Alder Kemble was the sole alder to speak against adoption and for the need to make Winnebago a street accessible by bike for riders of All Ages & Abilities. All the other alders that supported Option 2 previously, seemed to have tired of the debate and voted instead to prioritize on-street car parking over All Ages & Abilities bike facilities. Construction is expected this fall. The Madison Bikes Board will have their monthly meeting from 6:00 pm to 8:00 pm on Monday, July 16 at the Madison Public Library, 201 W Mifflin St, Madison, WI 53703. Please attend and learn what we are up to and how you can get involved! Madison Bikes Advocacy Committee will meet from 6:00 pm – 7:30pm at Bendyworks, 106 E Doty St #200, Madison, WI. The committee is always welcoming new people, if you’d like to help us out with our work on advocacy issues, feel free to stop by. Madison Area Transportation Planning Board will meet at 5:00 pm in Room 103A of the City-County Bldg. The new application for the low stress biking network is on the agenda. 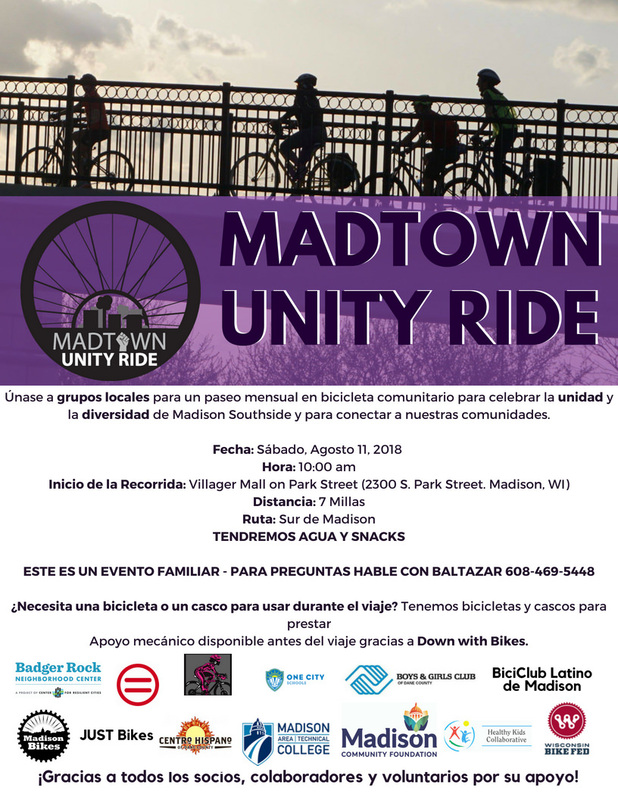 Tour de Familia Latina/Latino Family Tour hosted by BiciClub Latino de Madison will be from 10 am to 1 pm, check out the Facebook event for more information. This is a great ride for the whole family. Bike For Boys & Girls Club brings family, friends, coworkers and neighbors together for a fun-filled ride through picturesque Dane County one summer morning every year. Pledges raised support the ongoing mission of Boys & Girls Club of Dane County to provide programs that inspire and enable our youth to realize their full potential. Hundreds of riders will pedal their way across the finish line and into the post-ride party of cold drinks and even colder custard. You can get involved as an individual rider or join a team. Cyclists of all ages and abilities can join in on one of three planned routes. Sign up today and help empower Dane County kids. Mountain Bike Demo The best way to find the bike that's right for you is to spend time riding a few different models. Join Trek at Quarry Ridge to test ride a variety of all-new Trek mountain bike models! All you need to bring is a helmet, an ID, and your own pedals if you prefer something other than standard flats. Expert technicians will be onsite to help with fit and to answer questions. On Saturday, a great group was Riding 24 Hours in Support of Immigrants and Refugees, some for a short time, some for longer. You can see the photos, on Baltazar's Facebook page. About half of the Cap City Trail will be closed for six weeks starting Monday, so I hope everyone got one last ride in over the beautiful (and finally cooler) weekend. 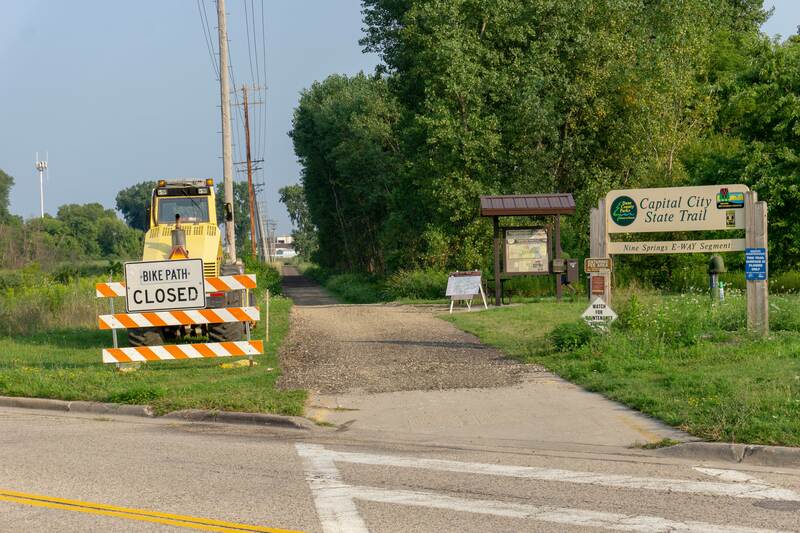 The county is repaving the trail from Nob Hill Road to Glacial Valley Road. In case you don’t know those cross streets, that’s more or less from just south of where the path crosses under the Beltine to just short of Fish Hatchery Road. It will be six weeks before it’s open again, but we’ll have a smoother riding experience. One the other hand, the county also announced that they are soliciting projects from communities to connect local bike trails to the existing county system trails. This is a great program, because smaller communities otherwise may struggle to find funding for important connections. The county program will pay up to 50 percent of the cost of design, engineering, and construction. Other than the inconvenience of a major bike route being unavailable, things are going to be pretty quiet this week. The Madison Bikes Events Committee will meet at 6:00 pm at Barriques on S Park St. We would really love to have some additional volunteers help us plan our events. Right now, we are working on the annual party for September, but there are lots of events we could do with more help. So, if you are great at throwing parties, or just are a good organizer of community events, come by and check out the committee. The Madison Bikes Communications Committee will meet at 5:30 pm at the Memorial Union Terrace. If you would be interested in helping us with blog posts, social media, or other outreach activities please feel free to stop by. We are usually near the outdoor beer window, but up on the level of the theater wing, but if you cant’s find us, shoot an email to Heather, the committee chair. Also on Tuesday, the Council will be considering the Winnebago project yet again. This time the recommendation is for Option 1B. Harald sent out an action alert on Sunday, so check there for more information. You can join the July Unity Ride at 10 am. 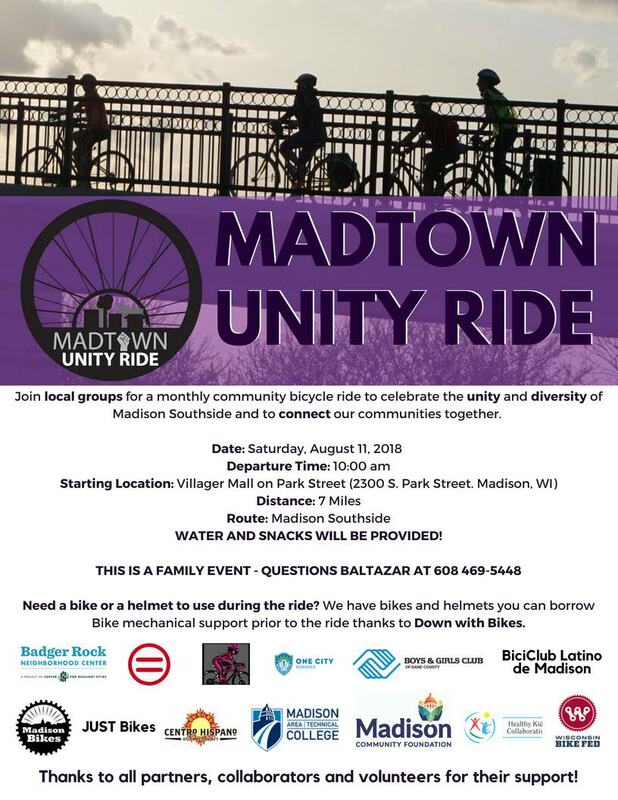 MadTown Unity Rides are organized by local groups to celebrate the unity and diversity of Madison Southside and to connect our communities together.The target audience for these rides is Black, Brown, Indigenous people of color, LGBT+ community and other communities that have been affected by discrimination who live or work in a predominantly low-tmoderate-income community in the Madison Southside. We use these rides as a vehicle to increase social cohesion at the neighborhood level, as well as highlight the assets and inequities which exist in neighborhoods across the Madison Southside. This is a family ride, so they will be going at a very relaxed, slow pace. The distance will be between 7-10 miles. And if you don’t have a bike or helmet, The group can arrange to lend you one. For more information and a map of the ride, check out the Facebook event. Winnebago Street is back at the Common Council, and we need your support. A very brief reminder of what happened so far: In early May, the Common Council voted in favor of reconstructing Winnebago Street between 2nd St and Bashford with buffered bike lanes ("Option 2"). Mayor Soglin then vetoed the Council's decision. At a later Common Council meeting, there weren't enough votes to overturn the veto. Therefore the project was put on hold. This presented an opportunity for re-thinking the project in a larger context, all the way from the Yahara River to Union Corners. Instead, Engineering brought back a new iteration of Option 1--the one that squeezes people on bikes into an unbuffered lane, with parked cars on one side and cars and buses on the other. And the one that the Council did not approve. The changes that Engineering made are merely cosmetic. The plan still forces people to bike in the door zone. They do not make the street safe and comfortable for people of all ages and abilities. I'm writing about the proposed plan to reconstruct Winnebago Street between 2nd St and Bashford Ave (agenda item 52086). I greatly appreciate that when the plan was in front of the Common Council in May, a majority of you voted for a cross-section that would have created buffered bike lanes. This would have created a Winnebago Street that is safe and comfortable for people of all ages and abilities. The plans that are in front of you now fail to achieve this. People riding their bikes on Winnebago would be squeezed between a narrow parking lane on one side and motor vehicles on the other. The changes that have been made do not change that basic fact. Please do not approve the proposed design. Monday Update: Happy July 4th! One important agenda item from the last PBMVC meeting was the return of the undead Winnebago Street Option 1 proposal. A few weeks back, the Common Council had voted for Option 2, which had buffered bike lanes and was supported by Madison Bikes. Mayor Soglin then vetoed the Council's decision, and at a subsequent Council meeting, there was no majority for any of the other options. Instead of going back to the drawing board and coming up with a comprehensive proposal for the whole corridor, Engineering made minor modifications to the failed Option 1 design and brought it back. 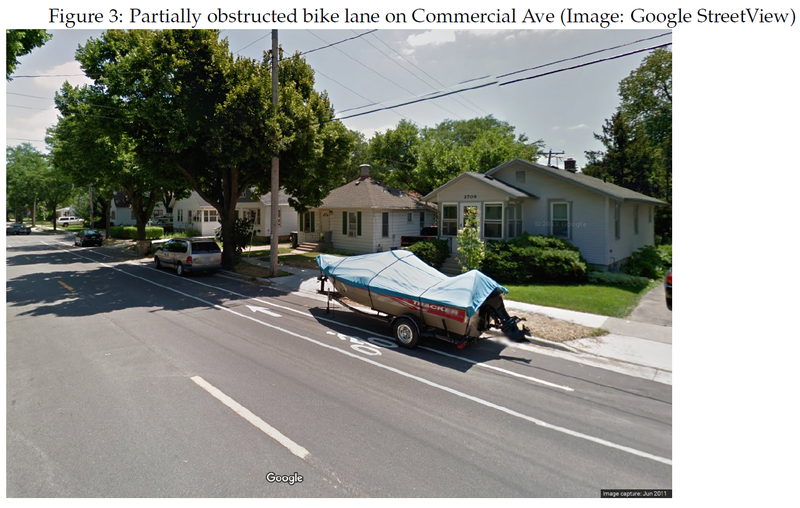 "Option 1B," as it is now called, suffers the same flaws for people on bikes: In order to preserve as much free on-street parking as possible, people biking on Winnebago would be squeezed in between a narrow travel lane on one side and a narrow parking lane on the other. The proposal will be back at the Common Council on July 10, and it will be important to voice your opposition to Option 1B. Stay tuned for an action alert. 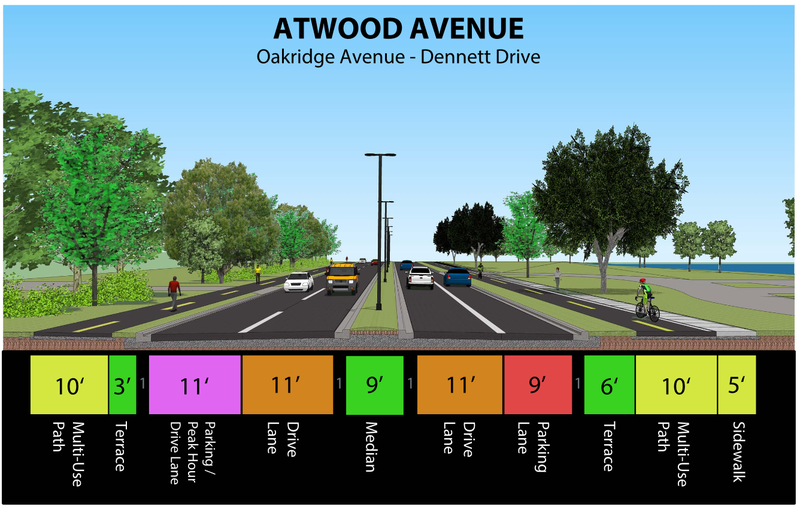 On a more positive note: The plans for reconstructing Atwood Avenue between Fair Oaks and Cottage Grove Road also were before PBMVC because the schedule for the project has been moved up. While not perfect, this project will greatly improve conditions for people on bikes and walking. Because of the holiday, things are quiet this week. On Friday, Revolution Cycles Cycling Club has their kick-off party for the season. "Come meet the crew, learn about the club, try on some kit from Verge Sport, and enjoy yummy snacks from our sponsors, Banzo." 7pm at Revolution Cycles. - Ride with Baltazar 30 minutes, one, two, three, or 24 hours. Only requirement: Use a white piece of fabric, or paper and write the following words: RIDING IN SUPPORT OF IMMIGRANTS AND REFUGEES and pin it to the back of shirt or jersey." Also on Saturday is the Fitchburg Festival of Speed, which includes a sanctioned bike race as well as more relaxed riding options. More details on their website.